At one time, the benchmark for performance 12 string acoustics was the Guild jumbo line, particularly the F-412 and F-512. Taylor has taken that spot with well built, comfortable 12’s that are almost as easy to play as a 6. 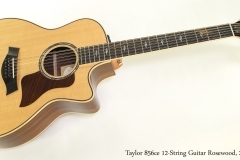 This Taylor 856ce dates to 2014 and is in overall quite good condition. 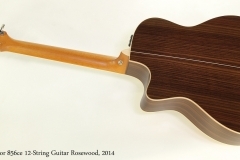 It features a Sitka Spruce top and Indian Rosewood back and sides, Mahogany neck with bound Ebony fingerboard. The headplate and bridge are also Ebony, and the rosette features an Abalone shell ring. There is very little wear of any kind, including absolutely minimal fret wear. “Taylor’s 12-string 856ce blends power, balance and crystal-clear articulation, harnessing rosewood’s full-spectrum tonal range to give players an expressive 12-string. An ultra-playable Taylor neck and Florentine cutaway make for easy fretting into the upper register, and proprietary Expression System 2 acoustic electronics translate all the sonic detail into a rich amplified sound.